Few animals instill quite the same fear as sharks. As apex predators, many types of sharks are well equipped to inflict serious injury; large, fast, powerful and armed with row upon row of razor-sharp teeth these fish are finely honed killing machines. 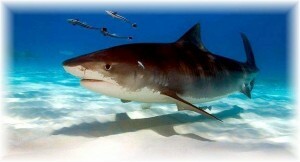 Yet with around 400 shark species, it is only a tiny minority that present any danger to humans. A review of the shark attack records held by the International Shark Attack File (ISAF) and the Global Shark Attack File (GSAF), displays that the fact that only a few species habitually attack people and that many of the other shark species need provoking before they will bite. Statistically it is incredibly rare for any species of shark to attack, but when they do the results can be so horrific that it is burnt into the popular psyche. Reports of victims bitten in two or half eaten by sharks the size of a school bus are always going to be at the back of many people’s minds as they dip their toe in the ocean. The Great Hammerhead Shark is actually a family of sharks which range in size from less than a meter (3 feet) to over 6 meters (20 feet). It is believed the strangely shaped head allows the shark better all round vision. To most observers, the different species are difficult to tell apart especially when they’re biting your foot off. It does seem likely though that it is the Great Hammerhead Shark which are the most likely candidates. Weighing up to 600 kilograms (1,300 pounds) and equipped with teeth similar to those of the Bull Shark, there is no doubt that the Great Hammerhead Shark could easily inflict deadly injuries on a human. It is also suggested that these may be more aggressive than other hammerhead species. The Blacktip Reef Shark is both common and widely distributed throughout the tropical & subtropical shallows of the world. It gets its name from the black tips and fringes to its fins & tail. Generally Blacktip Reef Sharks are fairly small measuring less than 5 feet (1.6 meters), however bigger specimens can reach up to 9 feet (2.8 meters) and weigh over 100 kilograms (220 pounds). What they lack in size they make up for in energy, often being seen leaping out of the water when chasing fish. Blacktip Reef Sharks are not generally regarded as being very dangerous to humans owing to their size but they are frequent attackers, making up the highest percentage of shark attacks in Florida. 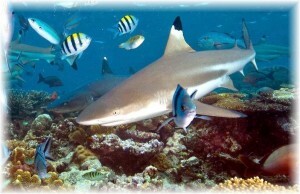 The ISAF has 51 attacks by Blacktip Reef Sharks on record of which 9 have been fatal. 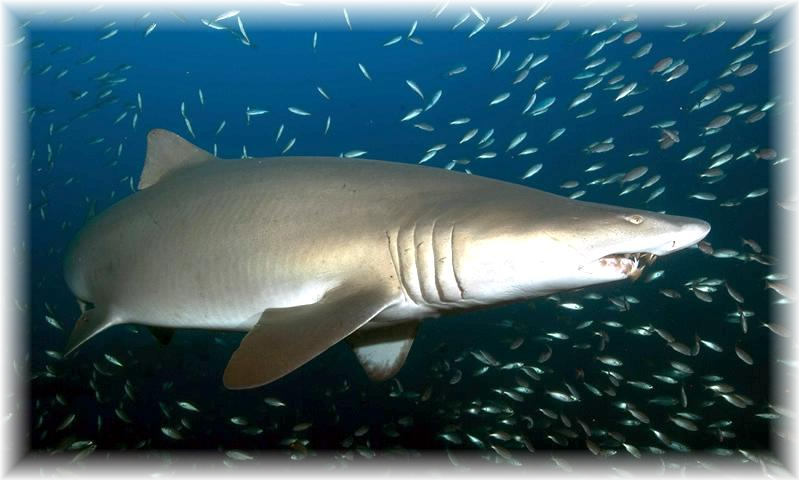 Many people are familiar with the Sand-Tiger Shark as the large sharks you see when visiting an aquarium. The Sand-Tiger Shark grows to around 3.2 meters (11 feet) in length and can weigh up to 160 kilograms (350 pounds). However, it is the ferocious looking teeth that tend to get people’s attention. There are three rows of long, sharp, pointy teeth which menacingly protrude from the shark’s mouth. Despite looking terrifying, the teeth are designed for grasping small slippery prey such as fish and squid. Sand-Tiger Sharks probably have a worse reputation than they deserve. The fact they are called ‘tigers’ and frequently roam the surf-line putting them into contact with humans does not help their cause. In reality, they are not Sand-Tiger Sharks at all and relatively docile. That being said, they have been known to attack and they have been responsible for 5 deaths. Many of the attacks seem to have involved spear-fishing where the shark has gone for the catch. There have also been a couple of incidents with people bitten in aquariums. Another member of the requiem shark family, the Blue Shark is one of the most widespread and common sharks. It can be found as far north as Norway and as far south as Chile, yet being a deep water species it rarely come into contact with people. This streamlined shark is capable of bursts of speed which it uses for chasing down its prey of squid and fish. The largest specimens recorded are over 12 feet (3.8 meters), but there have been unconfirmed reports of up to 21 feet. In the wild, the Blue Shark has few natural predators although it is said Killer Whales will take them. Larger sharks may also prey on small Blue Sharks, this was illustrated in 1969 at Sea World in San Diego where captive Blue Sharks were mixed in with Bull Sharks. Suffice to say the Bull Sharks thrived. In terms of danger, the odds a firmly stacked in humans favor. Between 10 and 20 million sharks are killed a year through fishing. 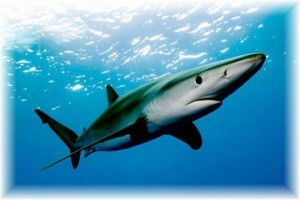 On the other hand the Blue Shark is considered potentially dangerous and has been responsible for fatal attacks. Some were the result of the shark being landed in a fishing boat but others occurred on shipwrecked sailors in the open ocean. The Blue Shark is known to circle swimmers and divers for up to 15 minutes and it may be more inclined to take a bite in such situations. 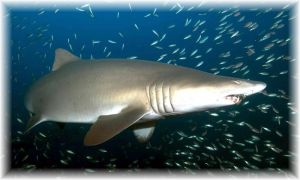 The Bronze Whaler Shark gets its name from its coloring and the fact that this and other sharks would congregate at the sites of whale kills in the days of whaling. The species are at its most prominent during the annual sardine run in South Africa where it will gorge on the fish in groups exhibiting feeding frenzy behavior. The Bronze Whaler Shark is a large shark reaching over 10 feet (3 meters) in length and weighing around 675 pounds (300 kilograms). It is a fast powerful swimmer equipped with long serrated teeth. With its size & dentition, the Bronze Whaler Shark does pose a threat to humans and has been implicated in quite a few attacks. It isn’t generally aggressive towards humans but it has been known to harass spear fishermen. There have also been a number of unprovoked attacks on swimmers & surfers along the east coast of Australia including being implicated in at least 5 attacks that proved fatal. 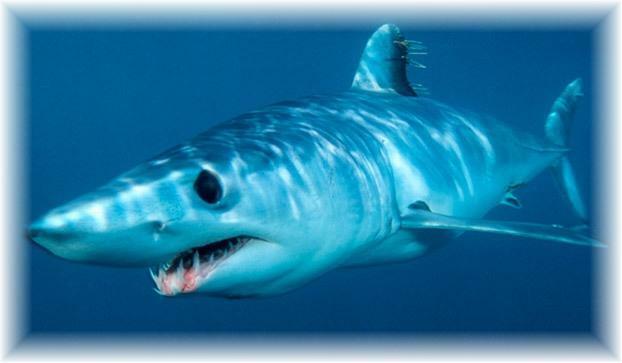 The Shortfin Mako Shark is a member of the mackerel shark family (Lamnidae). This family contains such illustrious members as the Great White Shark and prehistoric Megalodon Shark. It isn’t a big surprise then to find the Shortfin Mako Shark on this list. The warm-blooded Shortfin Mako Shark can grow to a fair size. Adults usually measure around 10 feet (3 meters) but the biggest Shortfin Mako Sharks can measure around 15 feet (4.5 meters) and weigh in at nearly a ton. Combined with its size, the Shortfin Mako Shark has an incredible turn of speed. This shark has been recorded at up to 46 mph (74 kmh) and some scientists suggest it can go much faster. With this speed, the Shortfin Mako Shark can make incredible leaps out of the water. One problem is that this often lands them in the middle of a fishing boat and they have been known to inflict severe injuries out of the water. Shortfin Mako Sharks have been responsible for 3 recorded deaths and have a reputation for aggression. 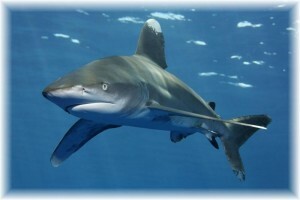 The Oceanic Whitetip Shark is the first of the sharks on this list that would genuinely be classified as a “man-eater”. It has almost definitely killed more people than all the other sharks put together. The reason it is not at the top of the list is the vast majority of these attacks were completely opportunistic and the result of air & sea disasters. There were several incidents of ships being sunk during World War II, in which it is believed Oceanic Whitetip Sharks were responsible for hundreds of deaths. While slow-moving and lethargic, the Oceanic Whitetip Shark can be incredibly aggressive and persistent. They are known to engage in feeding frenzy behavior and their attitude is to take whatever is available rather than avoid a fight and wait for the next opportunity. It is for these reasons, the late Jacques-Yves Cousteau referred to them as “the most dangerous of all sharks”. The Oceanic Whitetip Shark is a capable killer with powerful jaws, bold nature and often large size – the biggest specimen recorded was 4 meters (13 feet). As well as attacking in the open ocean, the Oceanic Whitetip Shark has been implicated in a number of fatal attacks on swimmers & divers near shore and in shallow ocean water. The Tiger Shark is big, common and aggressive. The name comes from both its temperament and the stripes running down its sides. It is also known as “the garbage can of the sea” as it commonly swallows anything it comes across. Objects recovered from Tiger Shark’s stomachs include bottles, tires, license plates, clothes, dogs, cats, pigs and even a whole small horse. More common prey include fish, seals, dolphins, birds and turtles. The Tiger Shark can be found in coastal tropical & sub-tropical waters around the world although they tend to stay in water deeper than 20 feet (6 meters). Tiger Sharks are the fourth biggest of all sharks with large specimens reaching well over 16 feet (5 meters) and weighing over a ton. It really is a bit of a bruiser with its heavy build and incredibly thick skin (8 times thicker than cowhide). They also have a proportionately wider mouth than other sharks. This prodigious mouth is lined with serrated teeth which are perfect for slicing prey, as opposed to gripping like many of the sharks above. Obviously humans are no match for a shark with these attributes and the Tiger Shark has a well-earned reputation as a “man-eater”. It is without doubt the most dangerous shark in the tropics and accounts for the majority of attacks in Australia & Hawaii. The statistics speak for themselves, the number of fatalities is second only to the Great White Shark and the death rate from attacks is high. The Bull Shark is considered to be the most dangerous shark of all by many. However, it doesn’t seem to have acquired quite the reputation of the Great White Shark & the Tiger Shark. There are several reasons why this shark is considered particularly dangerous including its physical attributes. 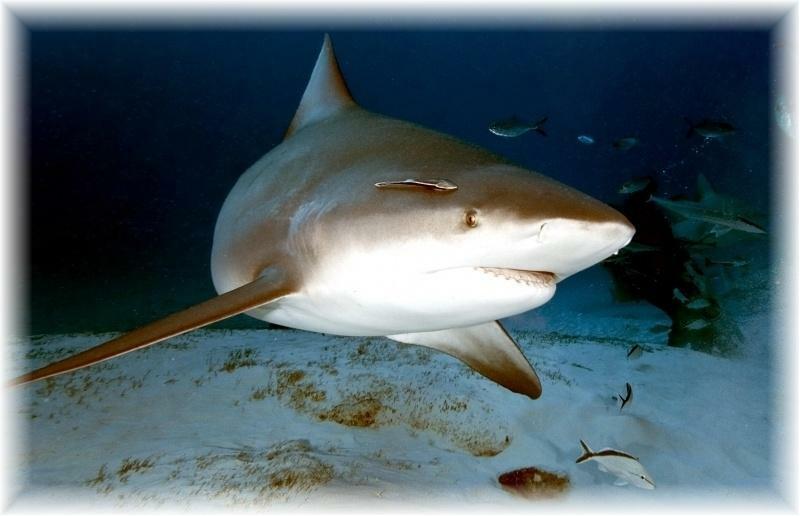 Bull Sharks also go by more names than most sharks, which is indication of its range & distribution. The Bull Shark is a large powerful shark, measuring up to 11.5 feet (3.5 meters) in length and up to 700 pounds (318 kilograms) in weight. It gets its name from its flat snout and stocky build along with its pugnacious nature. It comes well equipped in the jaws department too with several rows of triangular, serrated teeth ideal for slicing through prey. Highly territorial, this shark will attack other species that it feels threaten its territory and that includes humans. What makes Bull Sharks particularly dangerous to humans, is the likelihood of crossing paths with one of these brutes is higher than with any other of the dangerous sharks. Not only does the Bull Shark live in shallow coastal waters it can do something most other sharks cannot, tolerate freshwater. The sharks specially adapted kidneys allow it to travel thousands of miles up rivers and even live in lakes. Not happy with merely being able to swim up the rivers of the world, the Bull Shark has also claimed many victims in freshwater. 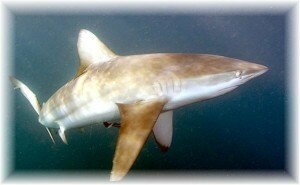 Ranked third by number of attacks in the ISAF records, it is believed that many of the Bull Shark attacks go unreported as they occur in the third world. Just the name Great White Shark is enough to send people running from the beach. Already notorious the Jaws movies of the 1970’s further demonized this shark and consolidated its reputation as a “man eater”. 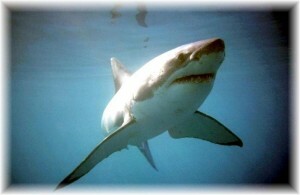 The Great White Shark is without doubt, one of planet Earth’s ultimate killing machines. The biggest Great White Shark specimens are around 6.5 meters (22 feet) in length. However, several reports of sharks as big as 8 meters (26 feet) and weighing nearly 3.5 tons have been published. Set between crushingly powerful jaws are rows of triangular teeth around 3 inches long which are serrated along either side. These are used to slice up the prey which the shark does by shaking its head from side to side. If a tooth is broken one from the row behind takes its place. This shark is no slouch either. When heading in for the kill, the Great White Shark can accelerate to 35 mph (56 kmh). Combined with its bulk, this is like being hit by a freight train and will stun or even kill the prey. With usual prey animals such as sea lions and seals, humans stand practically no chance against this beast. Great White Sharks actually have no interest in eating humans, nowhere near enough flesh and it seems most attacks are mistaken identity or the shark just being inquisitive. Unfortunately, a 3-ton Great White Shark giving an inquisitive nibble can involve the loss of an arm or a leg. These sharks occur in all the oceans of the world and tolerate water temperatures between 12-24°C (54-75 °F). They can be found in deep water or near the coast, generally around seal colonies. Great White Sharks are most concentrated around the shores of South Africa, Australia, Northeast USA, California, Japan and the Mediterranean. That last one surprises a lot of people, especially as there have been over 30 recorded attacks in the Mediterranean. Without doubt, the Great White Shark is the most dangerous of all sharks and the statistics back this up with over 400 attacks recorded worldwide of which many were fatal. Ironically, it is the Great White Shark that needs protecting from man and with numbers on the decline it is a protected species in many countries.